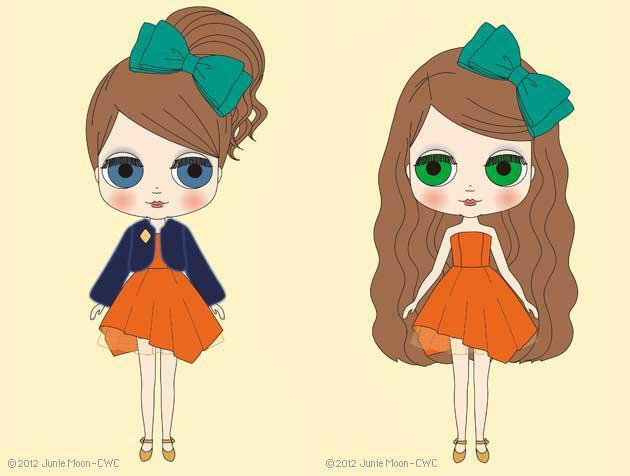 New Neo Blythe Release for February 2013. Orange and Spice is a pretty little thing. She has a bright orange strapless asymmetrical dress with a hint of gold tulle peeking from under with a Navy Blue bolero Jacket. She has a green hair bow and golden shoes. Her hair is long, dark brown with a loose perm and parted to the right. Her makeup is a dark blue eyeshadow, orange blush and pink lips. SHe has special dark blue right eye chips. She is an RBL mold and will sell for @ $172.00 US. She is a definite beauty! Oooooo I think I must have her! Where do you go for all your new Blythe info? I know me too!!! I just search the web and find them not in one place, all over. Hop you had a wonderful Christmas!!! Hugs! !